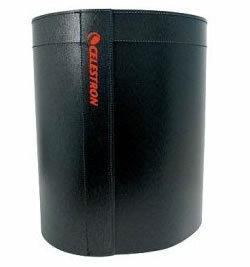 A Lens Shade/Dew Cap is a tube designed to wrap around the front end of your SCT telescope and reduce the amount of dew that builds up on the corrector plate. 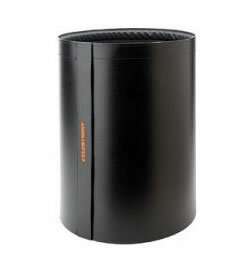 A Lens Shade/Dew Cap is a tube designed to wrap around the front end of your SCT telescope and reduce the amount of dew that builds up on the corrector plate. It also serves as a Len Shade by preventing stray light from falling on the corrector plate, which greatly improves contrast. 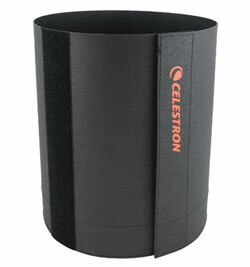 Celestron offers a complete line of rugged, but soft Foamex plastic lens shades that can be stored flat after usage. They are made from a thicker material that wont crack under temperature extremes. The quality level is a step above all others as all material is sewn (not glued) for a long life. A dual Velcro strip so that users can adjust the shade to a size that fits either a C6 or C8 Telescope. This model is compatible with all 11" optical tubes. This model is compatible with all 14" optical tubes.